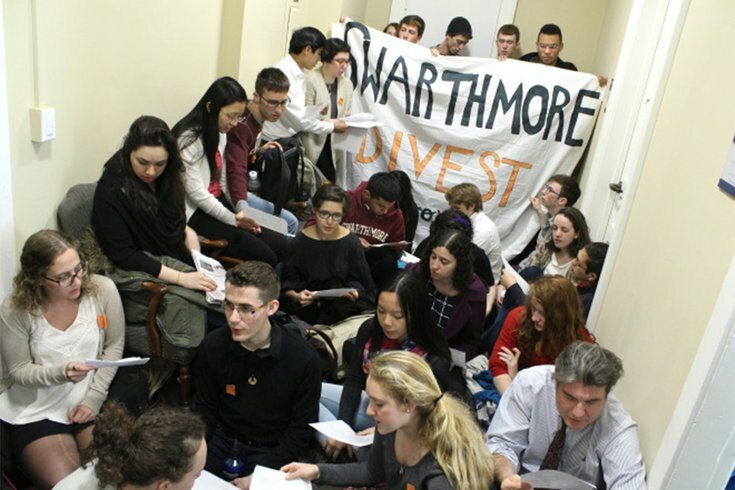 Members of Swarthmore Mountain Justice stage an extended sit-in in 2015 at the college's Finance and Investments Office in Parrish Hall to call for fossil fuel divestment. The group formed in October 2010 after students traveled to West Virginia to learn about mountaintop removal coal mining, which scientific studies have found can have significant environment and human health impact. Student activists at Swarthmore College said they've been threatened with potential fines and probation for a demonstration they held last month. The school's Mountain Justice group, which opposes the fossil fuel stocks held in Swarthmore's $1.9 billion endowment, said five students received emails from the dean’s office on March 17 notifying them of the possible punishment. "We find it shocking and disturbing that the administration would rather threaten students with fines and academic probation than meet and discuss the issue," the group said in a statement. Mountain Justice members said it is "unclear" why students who received the notices of potential disciplinary action were selected. But Swarthmore College President Valerie Smith said those who were picked out stepped over the line. In a statement on Thursday, Smith wrote that most students who assembled in the college's finance and investments office on Feb. 24 remained in the hallway of the office, much like a similar demonstration held two years ago. However, some entered the personal office of chief investment officer Mark Amstutz, according to Smith, "preventing him from completing all but the most menial of tasks and restricting his movements and rights." Those students were warned multiple times about potential consequences, the president said, but five remained anyway. "Refusal to leave a staff member’s office clearly does not adhere to our student conduct policy," Smith wrote. "That policy needs to be applied equally and consistently, no matter who breaches it." Mountain Justice refutes Smith's explanation of why the specific students were singled out, saying there were "multiple other students in the office." Will Marchese, a Mountain Justice member is one of five students accused of violating the college's conduct code, along with Rachel Pomerantz, Stephen O’Hanlon, September Sky Porras and Lewis Fitzgerald-Holland. Marchese claimed Friday the students who entered Amstutz's office were not disruptive. "The students and faculty at the sit-in made every effort to be courteous and thoughtful to Mr. Amstutz and public safety, even assisting Mr. Amstutz with his office tasks," Marchese said. The freshman acknowledges that the five students were warned about potential sanctions by campus safety. The issue, he claimed, is that the school is choosing to enforce it. Swarthmore's handbook states that a student's right to protest "will be respected," unless it interferes with official school functions. Protests are not permitted in some specified areas, including school offices. Students who violate the rule are subject to the college's "judicial process," which could result in potential probation or fines, according to the handbook, which leaves discretion for school officials on when and how to dole out disciplinary action. All five students met with dean of student conduct Nathan Miller on Wednesday, Marchese said. Miller laid out the charges against the students and asked if they wanted to undergo an administrative review — essentially a student trial — and all five said yes. 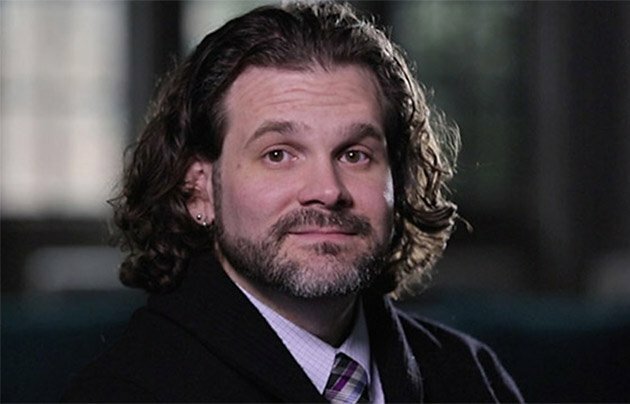 Nathan Miller is the associate dean of student at Swarthmore College. The decision to take action against the students is "morally obscene," Marchese said, citing Swarthmore's history of activism on campus. "They still have discretion as to whether they want to follow up," Marchese said. "The thing that's contentious is that they chose to cite the students." Swarthmore College officials responded to a call for comment to the dean's office Friday morning with an email linking to Smith's statement from Thursday. A separate call directly to Miller's office was not immediately returned. The sit-in and ensuing rally, which was live streamed on Facebook, was part of an ongoing effort from the group to pressure Swarthmore's board of managers to drop the colleges fossil fuel investment. The school's board of managers voted not to divest from the endowment in 2015 despite a 32-day sit in by students, who have been calling for the school to sell off the stocks in fossil fuel companies to combat climate change. Amid these protests, officials at Swarthmore, a private liberal arts college in Delaware County, have cited the college's investment guidelines, which allow the school to make endowments based on the best long-term financial results, not social objectives. Swarthmore Conservative Society, although opposed to the divestment movement, released a statement Wednesday in support of the Mountain Justice students. "The process in which the citations were issued is also a cause for concern," the statement read. "As far as we can tell, students who participated in the sit-in were not treated equally." The group argues that there is "no precedent" for Swarthmore enforcing rules against sit-ins, so the students who were protesting had no reason to believe they would actually be punished. Mountain Justice is now circulating a petition, directed at Smith and Miller, in support of the five students. "We stand with these students who took peaceful action to highlight the urgent need for moral leadership by the College on this issue and we urge you to affirm our community's right to peaceful protest," the petition reads.